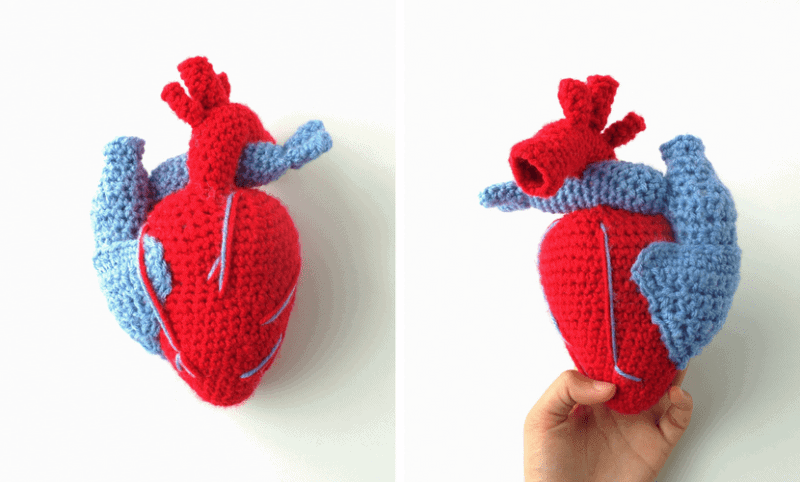 Today, I’m sharing with you a crochet heart pattern, but not just any crochet heart. This one isn’t the cutesy Valentine heart you might be used to seeing, but I think this realistic crochet heart pattern is a lot more interesting and fun to make. I made this for my dad last year after he underwent major heart surgery, and it was a big hit! You guys asked for the pattern and I even had requests for custom orders, so here it is! When I made this, it was a pretty rough time for my family. My dad, who had had a major bypass surgery ten years ago, was in the hospital again for another heart procedure. He’s a doctor himself so I thought something fun like this might lighten the mood. Although I couldn’t get every single structure of the heart in this model, my dad was so excited about this simple plushie. He would take it out to show everyone who visited him and he’d explain his procedure to them using this as a model. 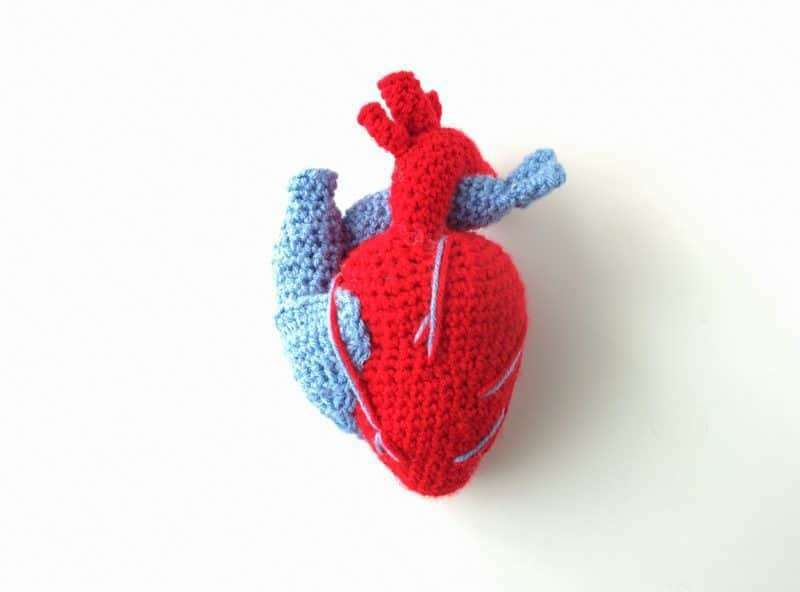 The crochet heart pattern is a lot simpler than you would expect just by looking at it. 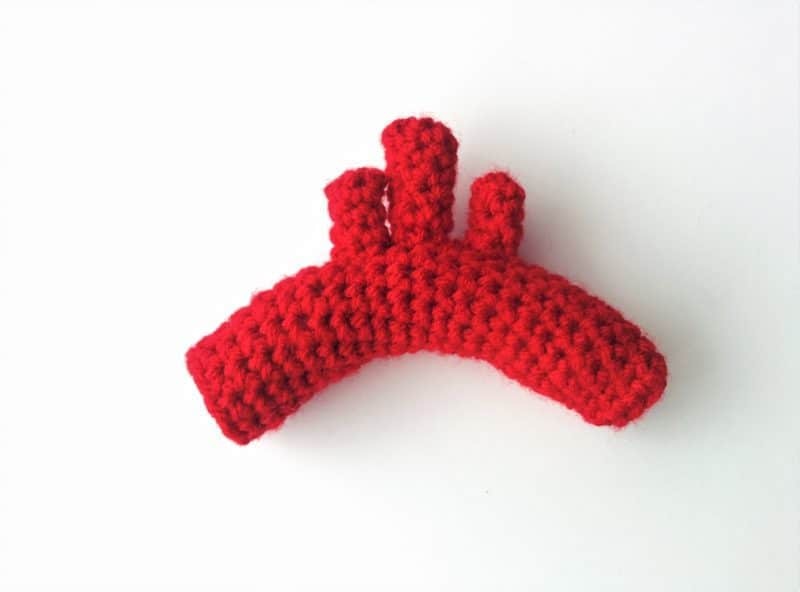 I worked each piece as a simple shape and then sewed it all together into the final shape. 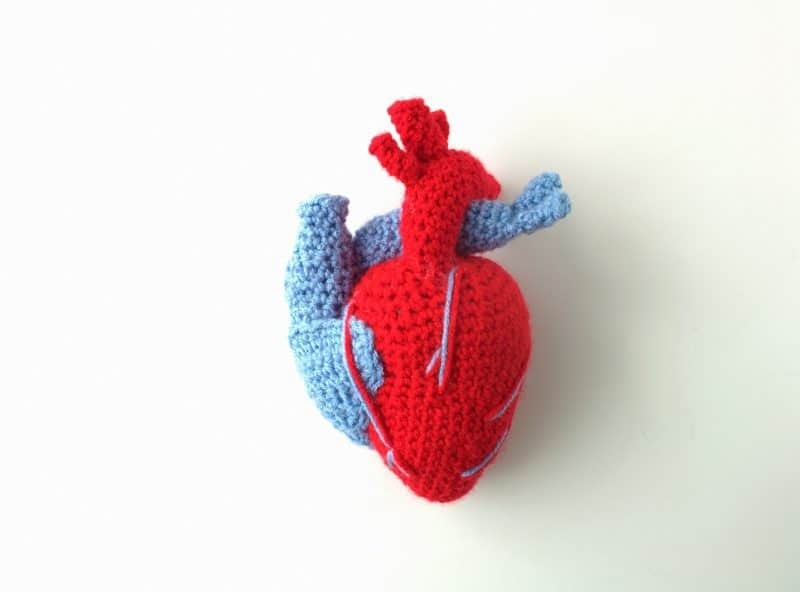 For the veins and arteries, I used blue and red yarn to make big stitches across the body of the heart. I wasn’t too precise about getting them in the right places, but I checked a diagram from a biology textbook to make sure I got the most important ones right. 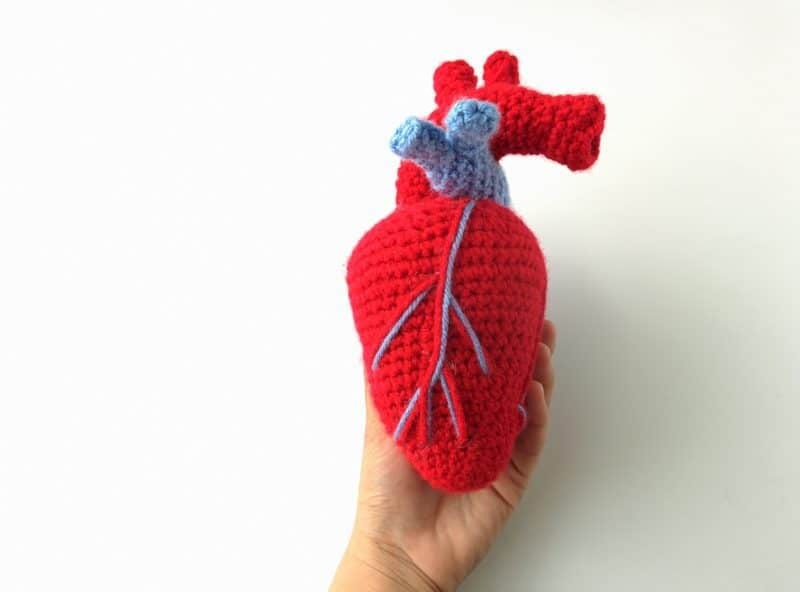 To make this crochet heart pattern, we’re going to start with the actual heart muscle and then add on all the other parts and veins to make it look realistic. Round 1: With red yarn, SC 6 into a magic loop. Pull loop closed and work in continuous rounds (6). Round 2: Work 2 SC in each space (12). Round 3: *SC 1, increase*, repeat around (18). Rounds 4-5: SC around for 2 rounds (18). Round 6: *SC 2, increase*, repeat around (24). Rounds 7-8: SC around for 2 rounds (24). Round 9: *SC 3, increase*, repeat around (30). Round 10: SC around (30). Round 11: *SC 4, increase*, repeat around (36). Rounds 12-14: SC around for 3 rounds (36). Round 15: *SC 2, increase*, repeat 3 times. SC around remaining (39). Round 16: *SC 4, increase*, repeat 4 times. *SC 1, decrease* to end (36). Rounds 17-8: SC around for 2 rounds (36). Round 19: *SC 2, increase*, repeat around (48). Rounds 20-21: SC around for 2 rounds (48). Start adding the stuffing. Round 22: *SC 4, decrease*, repeat around (40). Round 23: *SC 3, decrease*, repeat around (32). Round 24: *SC 2, decrease*, repeat around (24). Round 25: *SC 1, decrease*, repeat around (16). Round 26: SC around (16). Finish stuffing firmly. Round 27: Decrease in all spaces (8) and bind off, leaving a long tail. Then, thread the tail through a tapestry needle and run it through the front loops of the 8 stitches, and pull to close the circle. Round 1: With red yarn, chain 11. Slip stitch to the first space to join in the round. Rounds 2-23: SC around for 21 rounds, and BO leaving a long tail. We’ll curve it later when we add stuffing. Round 1: With red yarn, chain 8. Slip stitch to the first space to join in the round. Rounds 2-6: SC around for 5 rounds, and then BO leaving a long tail. Round 1: With red yarn, chain 6. Slip stitch to the first space to join in the round. Rounds 2-5: SC around for 4 rounds, and then BO leaving a long tail. Round 1: With red yarn, chain 5. Slip stitch to the first space to join in the round. Add stuffing to each of these pieces and sew the three small tubes to the top of the aorta. Round 1: With blue yarn, chain 10. Slip stitch to the first space to join in the round. Round 7: Increase in each space (18). Round 8: *SC 1, increase*, repeat around (27). Rounds 9-10: SC around for two rounds. Round 11: *SC 1, decrease*, repeat around (18). Round 12: Decrease around (9). Rounds 13-17: SC around for 5 rounds and then BO, leaving a long tail for sewing. Rounds 2-16: SC around for 10 rounds (9). And then BO. Round 1: With blue yarn, chain 6. Slip stitch to the first space to join in the round. Round 1: With blue yarn, chain 21. Turn, and SC across (20). Round 2: Ch 1, turn. SC across (20). Round 3: Ch 1, turn. Decrease twice, SC to last 4 stitches, decrease twice (16). Round 4: Ch 1, turn. Decrease once, SC across to last 2 spaces, decrease (14). Round 5: Ch 1, turn. Decrease once, SC across to last 2 spaces, decrease (12). Round 6: Ch 1, turn. Decrease once, SC across to last 2 spaces, decrease (10). Round 7: Ch 1, turn. Decrease once, SC across to last 2 spaces, decrease (8). Round 8: Ch 1, turn. Decrease once, SC across to last 2 spaces, decrease (6). Round 9: Ch 1, turn. Decrease once, SC across to last 2 spaces, decrease (4). Round 10: Ch 1, turn. Decrease once, SC across to last 2 spaces, decrease (2). Round 11: Decrease (1) and then BO, leaving a long tail for sewing. Now that all the pieces are done, it’s time to assemble the crochet heart pattern! First, lightly add stuffing to all of three of the larger tubes, but keep it mostly in the center so it doesn’t stick out the ends. Next, attach the superior vena cava (the blue tube with a bulge in the middle) to the side of the heart, sewing along the sides where the two touch. Then sew the right atrium (triangle) over the end of the SVC. As you work around, add a little bit of stuffing into the gaps to give it more depth. 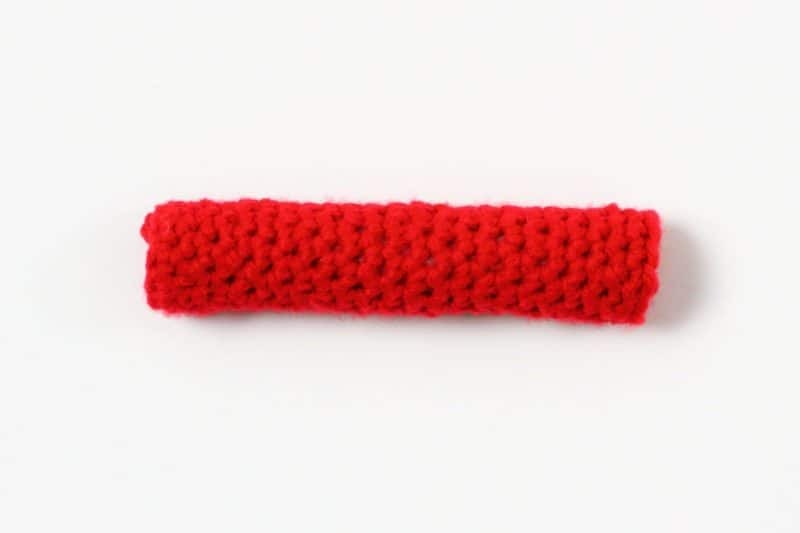 Now, sew the three small red tubes to the center of the aorta (big red tube) and bend the tube so it’s curved. Sew one end of the curved tube to the top of the heart, slightly closer to the SVC than the center. 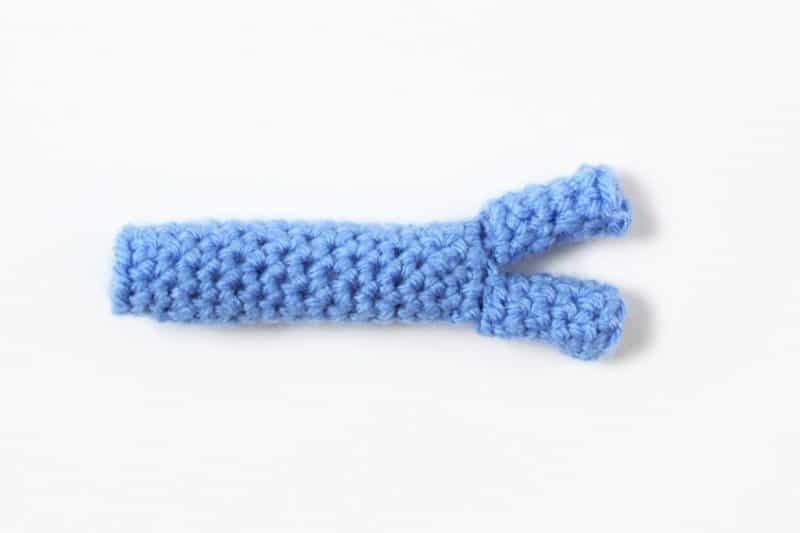 Sew the two small blue tubes onto the end of the pulmonary artery. Then, position the artery NEXT TO the curve of the aorta, and the end just behind the SVC. 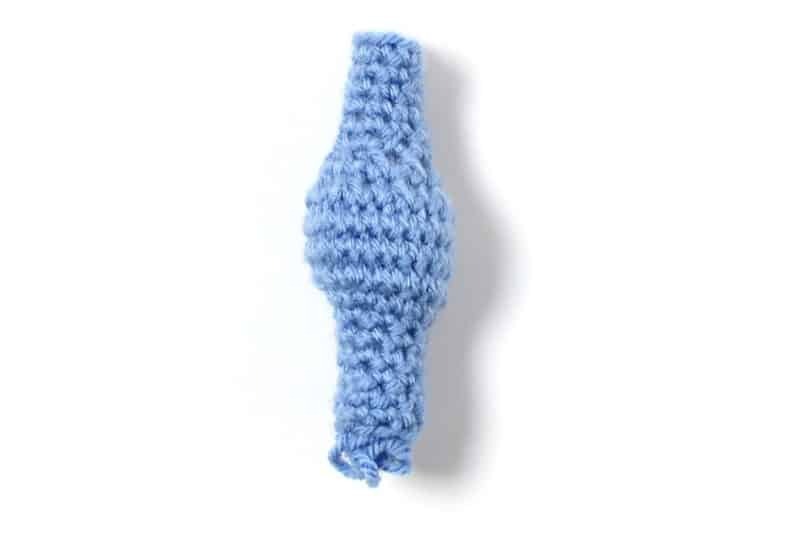 Sew it into place at the top of the heart, then continue sewing around the tube, attaching the aorta to it. Basically, make the curve of the aorta sewn in place, but leave the end unattached. 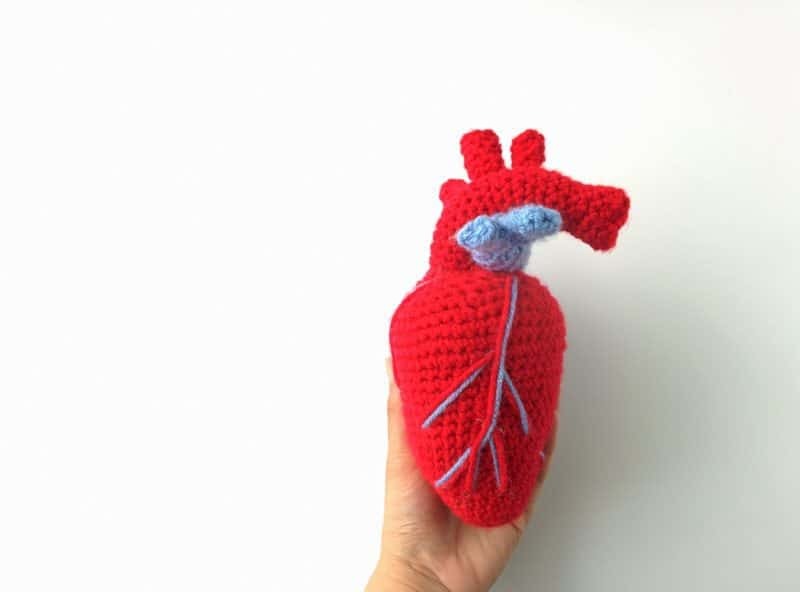 Finally, use extra yarn and your tapestry needle to embroider on the veins on the heart to make it more realistic (I just guessed where they should go). And then you’re done! 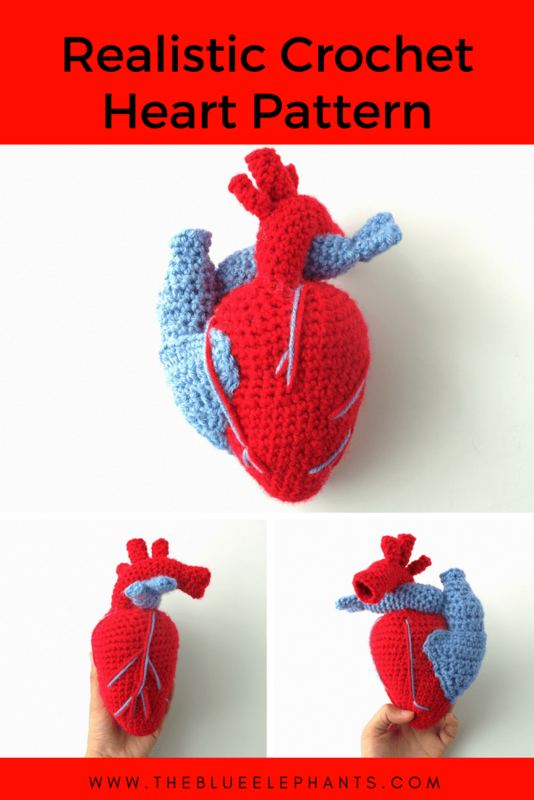 If you like, you can also use this crochet heart pattern and use only different shades of red and dark purple to make it even more realistic. 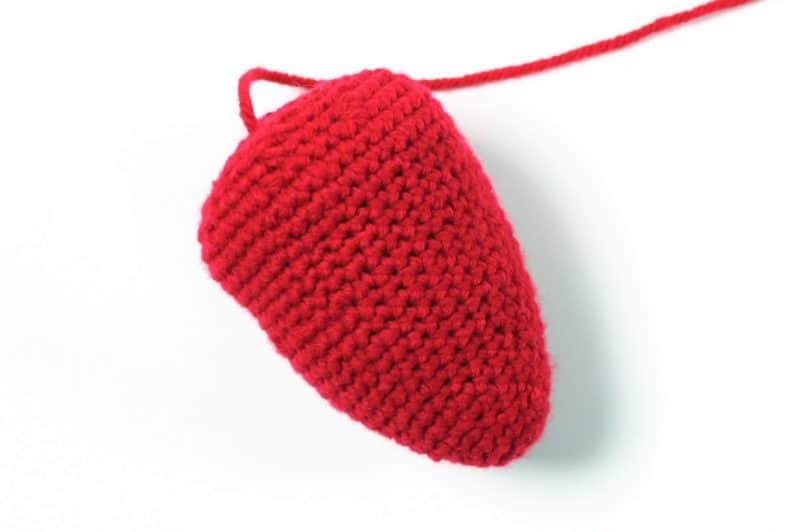 I think one of my favorite things about crocheting is being able to create things like this crochet heart pattern. It was random and spur of the moment, but the fact that I can use string to make something special and specific is amazing to me. My dad loves this and it feels amazing to have been able to say I made it for him. hope you all enjoyed this pattern! 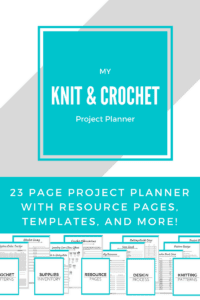 I’ll be back with more soon, but in the meantime, why not check out some of my favorite knitting and crochet books? I love books and I made a list of all my favorite resources for you guys! And if you want to get email updates when I post something new, subscribe to the email list below! 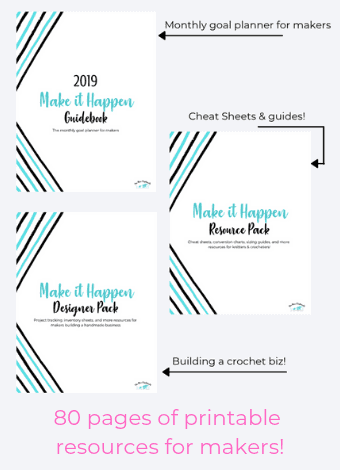 You’ll get access to the resource library with freebies and new patterns, tips, and more in your newsletter every week. 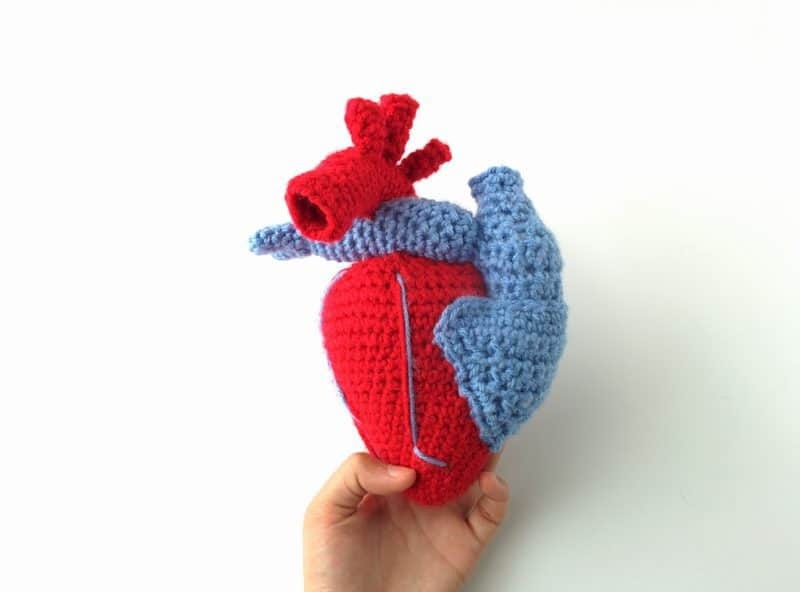 This is very cool, such a quirky take on the traditional crochet heart. Thank you, Julie! It was a lot of fun trying to get it right and I had all the doctors and almost-doctors in my family pitching in! Hey! I really love the pattern!! It is actually the first thing ever (apart from granny squares) that I am crocheting! I just have one question – for the main heart part, there is no row 17. Should I just do 18 and 19 (SC around) or should there be 3 rows of SC around? Thanks!!! You have such a talent for crochet! It’s great that your dad is doing better after his latest procedure. We all need to be more heart health conscious. Thanks for sharing at Snickerdoodle. Pinning. Thank you, Beverly! We absolutely do, and we need to be aware of these things before something happens. We all learn about heart health in school, but no one thinks it could affect them until it does. Love love love this post! Now if I can figure it out it will be even better I am better seeing it as well! I am living with heart disease for 10 years now and am currently 34. I had two heart attacks when I was six months pregnant, my daughter is a beautiful smart 10 year old now and you wouldn’t be able to tell she had a shaky start so I love the real looking heart and the fact that you are raising awareness! Thanks! Wow! Thank you for sharing your story, Amanda.. I’m turning 24 in a couple of days, and I can’t even imagine something like that happening. I’m glad that you and your daughter are doing well and I’m so glad that you liked my post and the hearts! 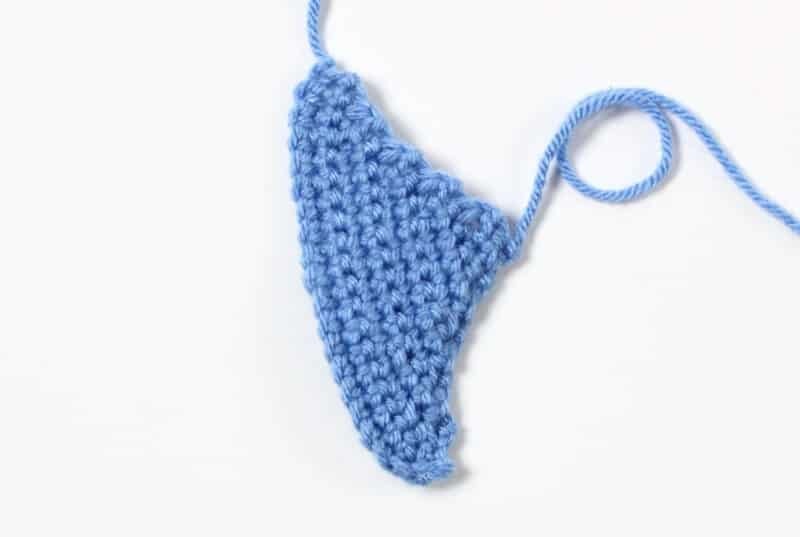 I love to make this crochet heart, but I am not good at reading the instruction, I wonder if you do video like Youtube?